Cherries are in season and thus on sale for approximately 5 minutes in the year in Queensland. I was fortunate enough to be at the grocery store during this time, and so grabbed as big of a bag as possible. 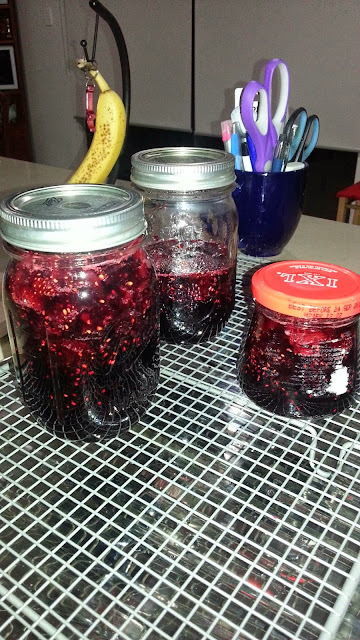 They are so good fresh, but I also made some cherry-berry jam tonight. Combine and heat until boiling vigorously for 5-10 minutes. Ladle into prepared jars. Process for 10 minutes. One of the best sounds in the world is your jam jar lid popping down due to the right vacuum seal. If not heard, process again, or put the jam straight into the fridge and eat within a few weeks. Interestingly, this would not qualify as jam by Canadian law, as it is only 50% sugar, and a minimum of 60% is required for that label. Otherwise it is labelled "fruit spread".